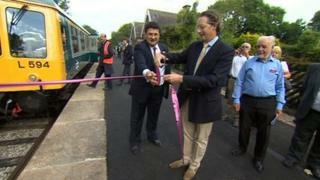 A countryside railway station has reopened to passengers for the first time in more than half a century. Derbyshire's Shottle station, near Belper, attracted 12,000 annual visitors during its heyday in the 1920s but closed in 1947. Heritage group Ecclesbourne Valley Railway restored the station and hopes it can be as popular as it once was. The Hon Richard Curzon, from nearby Kedleston Hall, officially opened the station. "It's the culmination of 18 months of very hard work, by a dedicated team of enthusiasts," said Neil Ferguson-Lee from the heritage group. "We are really proud to bring this lovely countryside halt back to life after 67 years of being asleep." The heritage rail group restored the unused and overgrown line between Wirksworth and Duffield and reopened it in 2011. Earlier this year, Wirksworth was connected to the national network for the first time in almost 70 years.